Love the hot cross bun flavours, hate the gluten, refined carbs, crappy fats & artificial ingredients that they’re full of. 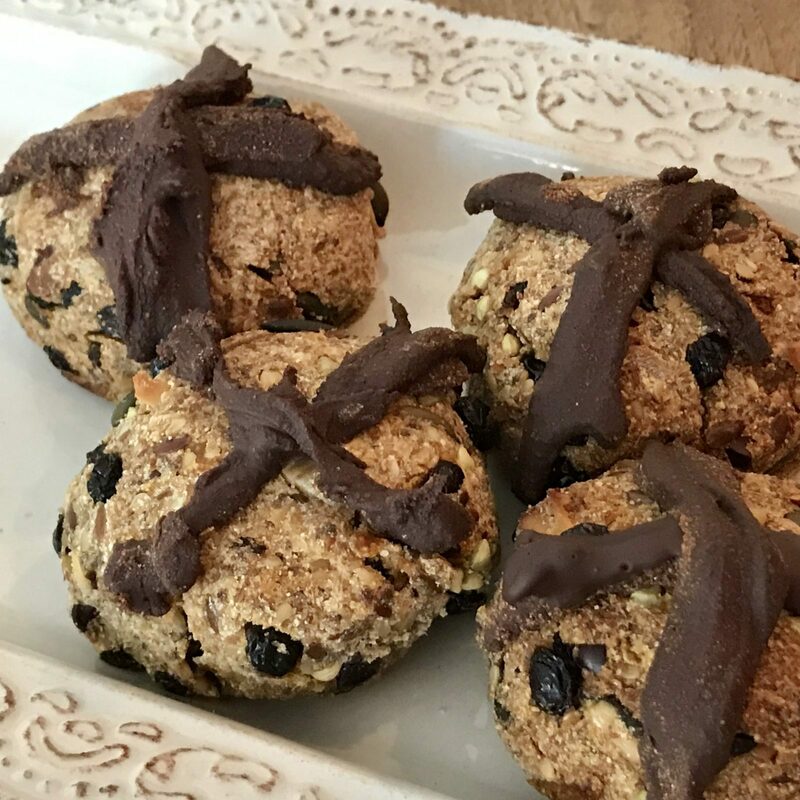 Here’s my version – these are made with Blend11 so are high in protein, fibre, good fats…nutritionally worthwhile eating as well as satisfying your Easter spice & fruit peel cravings! Your fave chocolate, melted in a double pot so as not to burn. Coconut flour (just mix in with melted choc to thicken it, enough to make a consistency you can work with easily & hold shape). Squeeze the mixture together with clean hands until well combined & all dry ingredients are moistened. You should have a ‘dough’ like consistency. Shape into small balls (approx 4cm diameter). Use the melted chocolate + coconut flour mixture to make crosses. I used my hands, but better / much neater results if you have any ‘icing’ equipment to load the choc into & squeeze out! Bake in a slow oven (170 degrees) for approx 1.5 hrs (check a bun to see if the inside has gone from ‘gluey’ to drier / just moist & ‘bready’. 12 small (but very filling, nutritious & delicious) buns! This entry was posted in and tagged Easter, healthy hot cross buns, Hot Cross Buns.